As vast tracts of cotton fields in Andhra Pradesh and Maharashtra turn into a suicide belt for farmers, there is increasing worry that the dizzying speed of technological change, both in seeds and pesticides, is leading to a critical problem for Indian farmers. Ever since GM or Bt cotton made its debut in 2002, farmers have been on a technology treadmill that is robbing them of their traditional agricultural wisdom that had earlier stood them in good stead. And scientists and academic researchers are warning that this is at the heart of the problem plaguing cotton cultivators, specially in rain-fed areas of the country where farmers have been trapped in a spiral of increasingly high input costs, although the success of the crop is dependent on the vagaries of the monsoon. According to the Raitu Swarajya Vedika, a collective of 40 farmers’ organisations, there have been 90 suicides in six districts of Andhra in the last month alone. There is even more dismal news from the Vidarbha Jan Andolan Samiti, which spearheads cotton growers’ cause in this arid region of Maharashtra: 671 suicides in the current year. In both states, the area under cotton has risen dramatically. To be sure, it is the failure of rains that has led to the failure of the cotton crop and the resulting suicides. But, says Glenn Davis Stone, professor of anthropology and environmental studies at Washington University, who has been studying farmers in Warangal district since 2000, GM or Bt cotton has been exacerbating a key problem underlying the suicides:Ã”Ã‡Ãªtechnology treadmills. What exactly is a technology treadmill? A pesticide treadmill occurs when pests like weeds and bugs evolve to resist the poisons designed to destroy them, forcing farmers to apply ever-higher doses or resort to novel poisons. Similarly, seeds are changed with equal rapidity when it is found that yields tend to taper off. For instance, there are over 800 Bt hybrids in the market developed from four gene constructs, a bewildering array for farmers to choose from. Stone, who makes it clear that Bt technology did not originally cause the treadmill problem, warns that technology treadmills can have disastrous effects on farm management. The seed and pesticide treadmills are slightly different, but both have vicious effects on local ecology, farm economy, and on the farmer’s decision-making ability. And the worst consequence is that they “destroy the farmer’s confidence that he will ever dig his way out,” he says. 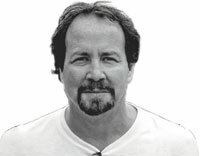 “I saw how farmers were trapped on the pesticide treadmill the first time I came to Warangal in 2000,” Stone says adding, “They kept asking me if I knew of any new pesticide because the insects had developed resistance to the last pesticide.” To press home their desperation, the farmers had made a bonfire of all the pesticides which they had tried and were no longer effective. Similarly, the rapid proliferation of Bt hybrid seeds has exacerbated the problem. Farmers get confused with the dozens of brands of seeds and pesticide that flood the market every year, says Keshav Kranthi, director of the public sector Central Institute for Cotton Research in Nagpur. It is extremely important that only tested and approved hybrids/varieties that are best suited to the region, along with the best package of practices developed by the research institutions should be made available to farmers. In the absence of such systems, farmers would resort to random use and inadvertent misuse and over-use of technologies, generally referred to as “treadmill”, thus wasting input resources and leading to higher costs and lower yields, he adds. However, companies tend to pooh-pooh such concerns. For instance, K K Narayanan, managing director of Metahelix Life Sciences which has several brands in the market, says, “Simple arithmetic will tell you that on an average a company has approval for 30 hybrids.” However, reality is not based on averages. “Some companies have over 50 hybrids approved, whereas some like our own have only a few. So even if all these companies are in the market, tell me how many hybrids will be there to really ‘flood’ the market?” Narayanan asks. More than enough, it appears, to confuse the farmers judging by their responses. Narsi Reddy, a farmer who grows cotton in four of his eight hectares farm in Mekaboddu village in Warangal, confesses it is always a toss-up which seeds to buy. “What happens is that usually most farmers pick what the neighbour is buying because we are not sure which seed to buy. Just as we were getting the hang of Bollgard I, we are told that Bollgard II is better.” Bollgard is a Monsanto brand marketed by its partners and its licencees. While Bt cotton was developed initially to fight the bollworm, now there has been a major surge in attacks by sucking pests against which this technology is ineffective. Kranthi warns that with an increasing number of new Bt cotton hybrids hitting the market every year, “there will be more and more new insect pests and diseases that multiply on the susceptible hybrids and create hotspots for the pests and diseases.” And the farmers will find themselves on a faster moving technology treadmill. The same problem, although with different species of sucking pests, has emerged in China and in some cases it has eliminated all the benefit of Bt seeds, says Stone. “Companies have a history of opportunistic statements about farmer wisdom” (see “Idea of farmer wisdom is relentlessly manipulated”). Reddy says that earlier he and other farmers would evaluate the seeds over a season or two before deciding which one to opt for. “But now everything changes too fast for us,” says neighbouring cultivator Chinatala Balaiah, who adds that such problems do not occur with rice cultivation. Apparently, in the case of rice, the same variety is grown till an improved variety promoted by the local Krishi Vigyan Kendra (KVK) is tested by the bigger farmers. KVKs are state-run extension service centres. Both Stone and Kranthi are critical of the manipulative attitude of companies. “It is unfortunate that farmers are being expected to experiment with so many hybrids on their small farms to decide which is best suited to his field based on their ‘traditional wisdom’,” says Kranthi. Several farmers would have lost their yields to pests, diseases and “location-unsuitability” factor in this hit-and-miss method over the past 10 years. It requires huge effort, infrastructure, and scientific manpower even for organised expert agricultural research systems to identify the best hybrid for a specific location. Leaving such a scientifically intensive process to farmers is unfair, they add. Stone believes the choice of seeds was frequently the result of a fad. Based on his surveys conducted in 2005, the US academic found that often two nearby villages would have completely different favourites, with no agro-ecological rationale. “It is a clear result of farmers not being in a position to make any assessments,” he insists. With things changing so fast in the fields, the farmer may find that his traditional wisdom is an attribute of the past—that is, if he can get off the treadmill long enough to understand this disconcerting fact. Its true that the the Indian farmers were trapped in technological treadmill. 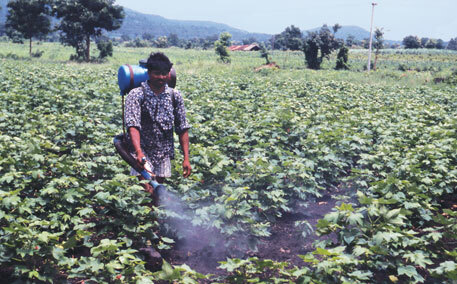 The range of pesticides and combination of pesticides available in the market is enormous. So is the case with the hybrid seeds. Every company tries to promote its own brand of pesticide and seeds. Also one particular hybrid seed that has given good result, cannot be trusted for giving the same good result next year. 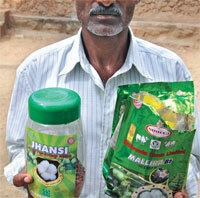 Any one technological error in manufacturing the hybrid seed will cost the farmers dearly . I have seen incidences where the seeds haven't event sprouted and some hybrids after growing well failed to bloom and standing sterile. It isn't shocking that these companies simply want to sell their products; so goes business. However, I don't understand why, after many years, they don't realize what their encouraging? And if they do, wouldn't it be changing the economy drastically and therefore, effecting themselves? Or maybe I missed where these companies reside. I can see the greed and whole "out of mind, out of sight" idea if they live far away. Still... It's sad to learn this. Spreading of high yield hybrid varieties of crops among traditional cultivators affecting, to some extent, their tradition and culture. Rice is one example. Hundreds of local rice varieties are there in our country. Some are having special adaptation to some local conditions. Many are related with some traditional foods or rituals of the community concerned. In Assam, there are different traditional preparations of rice and some varieties are specific for some particular items. Among the traditional farmers, especially in the upper Assam, there are different rice varieties specific for some traditional rice preparations such as 'chira'(rice flake),'Hurum' and 'Aakhoi'(rice puff), 'Komal chaol'(special parboiled rice which can be taken without cooking), and more others. Different communities have their own choice of rice variety for cultivation to meet their own cultural needs. But the concerning fact is that most of the local varieties are under threat of extinction due to avoidance of farmers as these are not high yielding. Most farmers are convinced to use advanced technology and high yield varieties. saddest part of the story is that it is not known to most of them what they are loosing in terms of traditional knowledge and culture of their own for the better feeding of the population.